When applying the Yin Yang theory to your home’s Feng Shui, balance is key. To get there, you’ll need to know what constitutes as Yin or Yang and how to balance them with methods backed by science. That is what this article is about. To begin, let’s first briefly explore what the Yin Yang theory is. If you’re already familiar with this, you can jump to the next section. I’m sure all of you have seen the Yin Yang symbol. It is the circle divided circularly in half. Half of it is black, and half of it is white, each has a little dot of the opposite color. The black areas symbolize Yin, while the white areas symbolize Yang. 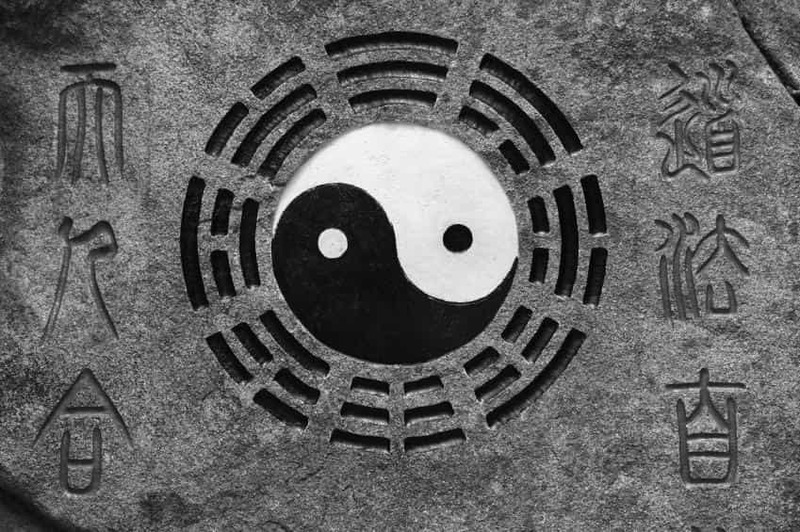 Above is the symbol of Yin and Yang surrounded the symbols of the 8 Kua’s (also seen on Bagua mirrors). The simplified interpretation of the image is that the world is a balance of two opposite but complimentary forces. One force is the Yin and the other Yang. The little white dot in the black area means a little bit of Yang is within Yin and vice versa. Female is Yin and male is Yang. Males are usually more active (and aggressive), while females are more passive (and passive-aggressive). Day is Yang and night is Yin. Though daytime and night-time varies by season and region, both are balanced throughout the year. Movements are Yang and stillness is Yin. An example that most of us can relate to is when a restaurant is empty and feels “dead”, while a restaurant that’s busy feels “lively” and vibrant. Below is an infographic I grabbed from Esoteric Studies that gives you more examples to understand the Yin Yang Theory. Now that you have the basic idea, let me quiz you: which rooms of your home are Yin and which are Yang? 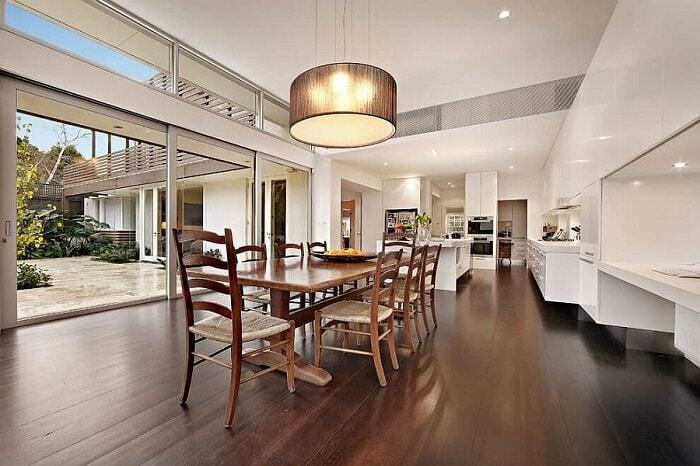 Different rooms (and areas) of your home serve different purposes. As such, each has their own Yin and Yang requirements that should be balanced accordingly. So before we get into identifying and balancing the Yin Yang of an area, you need to first know what the room should be balanced with. From the examples above, you probably have a good idea of what rooms should be balanced with Yin and what with Yang. Here’s a hint: just think of your rooms in terms of how active and how private they are (or should be). Your bedroom should have more Yin energies than Yang. That’s because the main purpose of the bedroom is for rest. Thus, it favors stillness, darkness, and cool temperatures that all help induces sleep (which you’ll learn more about later from a scientific standpoint). It is also the most private area of your home. Bedroom favors Yin energies that help induce sleep. 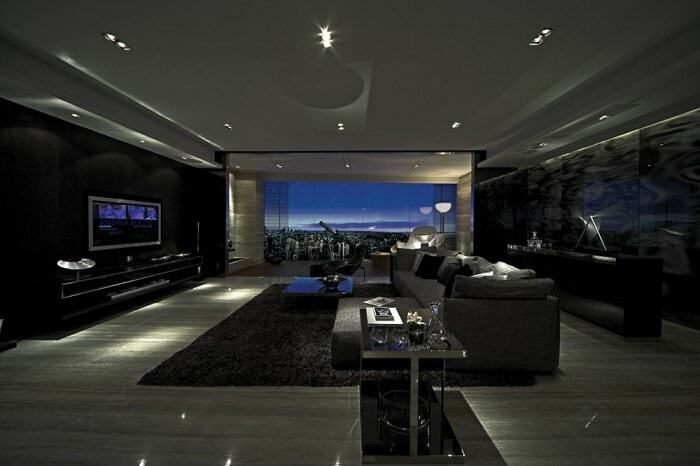 Living room is where you welcome guests. It is usually the first place that guests interact with when they enter from your front door. This place favors an active and vibrant environment rather than one that puts you to sleep. Just like the living room, your dining area should have more Yang energies. It is where family and friends gather and converse. It is also a public place to welcome friends and family. The human presence and activities in this area is what makes this place prefer Yang energies. This is also a highly active area because all family members come here for food. This is especially true for kitchen with island designs where people (and guests) dine on kitchen counters. Further, the heat from kitchen’s cooking fire are considered to be a Yang energy. 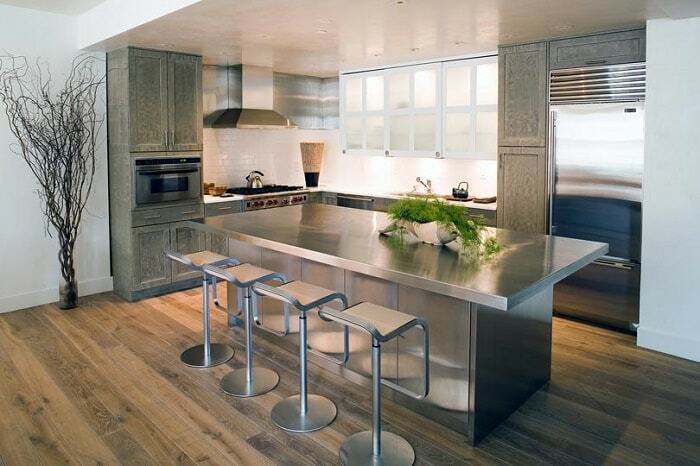 Some kitchen designs have islands for dining. Restrooms are a bit more private. This place needs to be relaxing and quiet for you (and your guests) to take care of business with comfort. Although restroom prefers Yin, most restrooms I’ve seen are too Yin (like too much humidity that causes health-threatening mold to grow). In those cases, the restroom should be counter-balanced with Yang, like having proper ventilation for air to circulate. This should be quite evident. Storage rooms are filled with “stillness”. They are places where even the homeowners rarely visit and lack human presence. The Yin energy that gathers in this place usually attracts insects, pests, and their likes. Earlier, you’ve learned which rooms should have more Yin energies and which Yang. However, whether a place is Yin or Yang totally depends on its environmental setting. Let’s use the living room as an example. Just because it prefers Yang energies, doesn’t mean it actualy has Yang energy and qualities. For instance, big houses in California can sometimes have two or more living rooms. When that’s the case, there’s usually one living room that’s deserted. The deserted living room actually has Yin qualities simply because it lacks the presence of human activities. To some extent, the Yin Yang qualities of these unused spaces are similar to storage and empty rooms. This concept applies not just to living rooms, but to all kinds of rooms and living spaces. Here’s another way to understand this. Imagine you’re the ONLY ONE living in a mansion with 30 rooms, whether they be bedrooms, study rooms, or living rooms. Those empty spaces all have Yin qualities. When combined together, they make people feel creepy. That’s why most scary movies feature one (or a few) individuals in a big mansion (or castle). To add to that, imagine if the mansion is old, dimly lit, and is deafening quiet because it’s in the middle of nowhere. If you’re the only person living in that mansion, wouldn’t you feel like you’re the star of a scary movie? 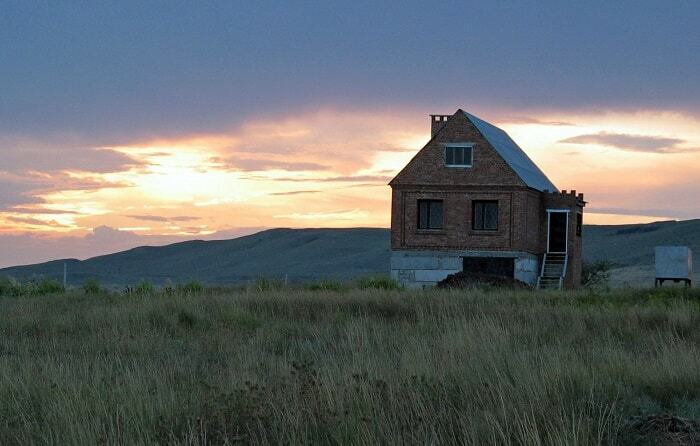 How would you feel if you’re the only one living in this house? The amount of light and sound are just a few ways to identify how Yin or Yang a place is, which you’ll learn more about later under “Balancing Yin and Yang”. There’s also quite a few surrounding Feng Shui which you need to look out for, such as graveyards, hospitals, churches, and the likes. Those bring strong Yin energies and are what I call Feng Shui hazards, which you can download the ebook here. Next, let us explore what happens when you live in a home or room with a Yin Yang imbalance. How would you fare if you lived 10 years in that mansion we just talked about earlier? How about living 10 years in a basement with no windows, even if it’s in a house with perfect Feng Shui? If you thought about those answers, you’ll notice that there’s a difference between living in a house and living in a room with Yin Yang misbalance. I’ve briefly outlined them here. Here’s an easy way how to tell if your house has Yin and Yang imbalanced – count the number of Yin rooms and the Yang rooms. 1. Refer to the above section: The Yin and Yang of Your Living Spaces. Identify which rooms are Yin and which are Yang. (Bedroom, storage, restrooms, and empty rooms are Yin. Living room, kitchen, dining room, and work areas are Yang. 3. 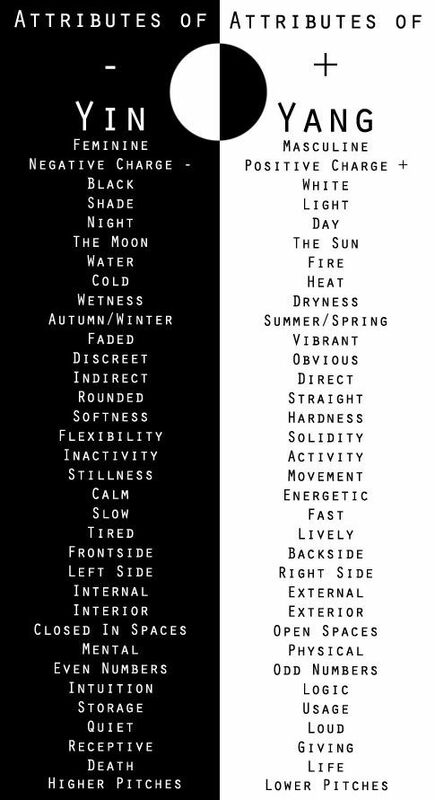 Compare the Yin and Yang spaces. Are there more Yin space or more Yang spaces? In essence, it’s similar to the mansion example I mentioned earlier. If you have lots of empty rooms, you’ll have lots of Yin spaces. If your home is overcrowded, you’ll have a house with strong Yang energies. If you’re the only one living in a big house, you have more Yin spaces than Yang, resulting in a house with imbalanced Yin Yang. Living in a house where Yin energies are strong can cause sickness, disease, and lack of motivation. Living in a house where Yang energies are strong can cause bad temperament, high blood pressure, arguments, heart and liver problems. If the Yin and Yang are balanced, even if it’s approximate, then you’re in great shape. The effects of this are not as bad as living in a house with imbalanced Yin Yang energies. However, the resulting problems can accumulate and create more stress over time. For instance, if your bedroom has strong Yang energies, your sleep may be affected. We’ve all been through sleepless nights a few times, but imagine if this was constant. If you don’t get enough sleep, you are putting yourself at risk. To mention a few, you may be risking weight gain (oh no! ), sickness, distractedness, depression, memory problems, and even death! That’s perhaps why the bedroom is one of the focus areas of Feng Shui (alongside front door and kitchen). For those of you who are curious about the side-effects of sleep deprivation, here’s an article that talks about 27 horrible things that happen if you don’t get enough sleep. But that’s just the bedroom. If your living room has strong Yin energies (as opposed to Yang), conversations with your guests may shorten, or your guests may simply feel uneasy and tired. That’s not something you want as a host, do you? How do you like this living room? Do you feel energetic or sleepy? So, what can you do in situations where Yin and Yang are not balanced? Here are seven methods to balance Yin and Yang. 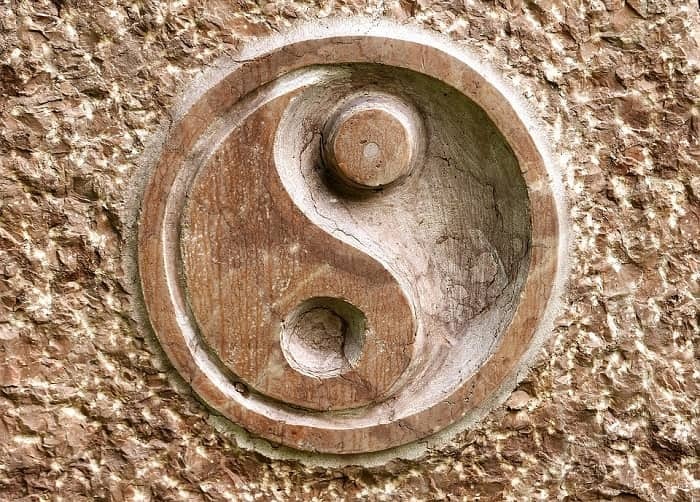 I’ve cited scientific resources to support the Yin Yang effects as explained by Feng Shui. Brightness is Yang, and darkness is Yin. Let’s use the bedroom as an example. Because your bedroom prefers Yin qualities, the light levels shouldn’t be too bright because brightness levels can affect how well we sleep. Science has shown that light exposure can cause our biological clock to advance or delay, which includes light coming from light bulbs. This is especially true with LED lights, where people have experienced sleep deprivation and exhaustion because of its brightness. Light exposure can cause our biological clock to avance or delay, which affects our sleep and wake cycle. Source: Harvard University. 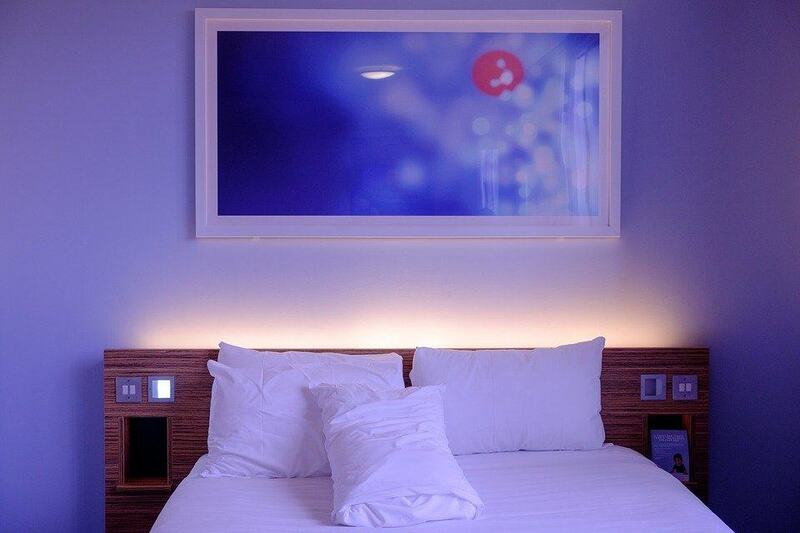 When you’re doing Feng Shui for your bedroom, remember not to use light bulbs that are too bright. The opposite goes with rooms that prefer Yang energies, like the living room, where you’d want people to be awake and active with brighter lights. Brighter colors are Yang, and the dimmer colors are Yin. This is depicted by the Yin-Yang symbol, where the black part is Yin, and the white part is Yang. The Yin Yang of color and its effects coincide with what experiments have found, where certain colors are known to trigger certain emotions from us. Here’s an image of how brands are using colors to trigger certain emotions from us. Modern commercial brands use colors to induce emotions. Image credit: The Logo Company. Using the bedroom as an example again, Yin colors that are calm, relaxing, and helpful for falling asleep are suitable for the bedroom. Brighter colors are suitable for more active areas, such as the living room and the bedroom. Silence is Yin, and noise is Yang. Sleep is a Yin activity, which explains why experiments found that the noise as faint as whispers has the ability to harm the quality of our sleep. Other studies have suggested that exposure to sound can shift our deep sleep stages to lighter ones. The noise is a form of Yang energy that affects our needed Yin activity – sleep. Conversely, I’ve noticed many people have used sound to create a livelier environment that combats feelings of loneliness when they’re home alone. Some people play music on the stereo, while others simply just turn up the volume of their television. This method does not apply to everyone. Although experts say that clutter is not really part of Feng Shui (and I agree), clutter does have an effect on the energy quality of your home. In terms of Yin and Yang, clutter is said to bring Yin energies. That’s because clutter is mostly stagnant, which brings similar energies like storage rooms. Clutter is said to bring Yin energies that negatively affect us. The negative effects of clutter as discovered by science are similar to the effects of strong Yin energies. 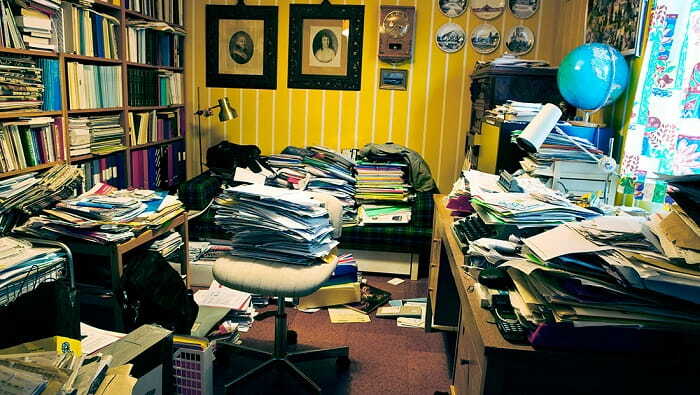 Experiments have shown that clutter can cause increased stress levels, inability to focus, and increased likelihood of depression. This is similar to feelings with the presence of strong Yin energies, such as lack of initiative, inability to concentrate, and depression. The solution here is quite simple – just get rid of clutter. Please note: clutter brings unwanted energy, so DO NOT use it as a way to create Yin energies. Meaning, do NOT use clutter to create more Yin energies in your bedroom. Humidity is Yin, and dryness is Yang. This mostly applies to the restroom and to areas with high humidity. When humidity and its Yin energies accumulate, it creates a perfect environment for black mold to grow. And guess what, mold is known to cause sickness, just like a strong presence of Yin energies. To be specific, mold is known to cause nasal congestion, throat irritation, and other respiratory problems. For children, the effects can be detrimental that can even lead to death. Although your restroom prefers Yin energy to relax so you can take care of business, it should not be too Yin. You still need to balance it with Yang energies to prevent the accumulation of Yin energies that can harm you in the long run. For those of you that are thinking of becoming dog or cat owners, read on. The presence of cats and dogs brings life and Yang energies, more so than other pets such as turtles, fishes, or birds. They are great for people living in houses that are too Yin, such as those living by themselves or those living in large houses with only a few occupants. 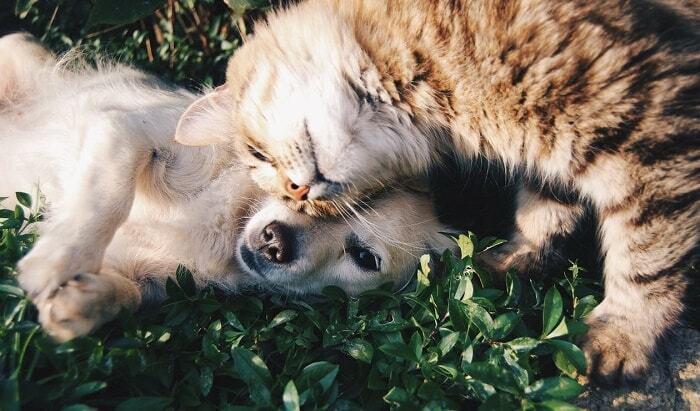 The presence of pets, such as dogs and cats, bring life and Yang energies. The presence of these furry animals gives companionship, social interaction, and physical contact. All of this helps fight depression and feelings of loneliness for those that live alone in large houses. Often times, these emotional benefits can translate to physiological ones, improving breathing rate, blood pressure, oxygen consumption or anxiety level. For those living with huge families or frat houses, having pet(s) can bring an over-abundance of Yang energy. That’s when you might feel irritation – as if there are too many things demanding your attention. Warmth is Yang while coolness is Yin. Here are two examples of how this applies to the Yin and Yang of your rooms. We already know that the bedroom prefers Yin energies. Now imagine – if the brightness is adjusted to the right level to make your eye-lids heavy, what would happen if you make the room 90 degrees Fahrenheit (32 Celsius)? Not too comfortable anymore, is it? The optimal energy to get quality sleep is between 60 and 67 degrees Fahrenheit (15.5 – 19.4 Celsius). Also, studies have shown that light and time aren’t as important as room temperature when it comes to sleep. This coincides with the Yin Yang principles of the bedroom. 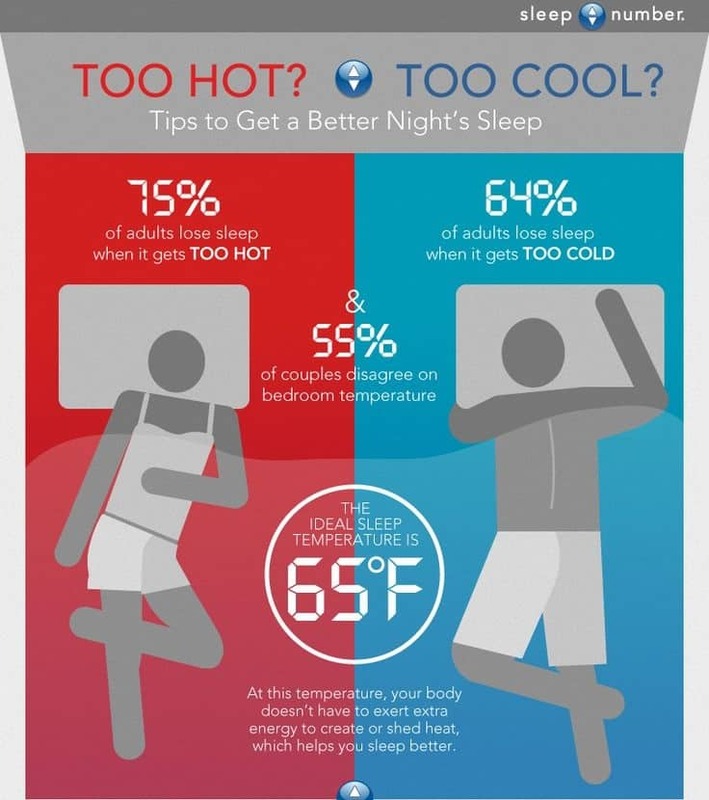 How adults are losing sleep due to temperature, courtesy of sleepnumber.com. To view the full infographic, click here. Now, let’s shift gears to work areas. A 2004 publication by Cornell University suggests that warmer temperatures are linked to higher worker productivity. The study found that typing errors fell by 44% and typing output jumped 150% when temperatures are increased from 68 to 77 degrees Fahrenheit. (20 to 25 Celsius). Other studies conducted at a later time have similar findings, though temperatures vary. Again, the study validates the Yin Yang theory, where active environments favor more Yang energy, while inactive environments favor more Yin energy. To some, the bedroom appears dark. To others, it appears normal. To some, the office is too warm. To others, it is just the right temperature. The Yin-Yang requirements differ for each individual. The most noticeable difference is the temperature requirement for men and women. Females lack the heat-generating muscle than their male counterparts, so optimal temperature for females, like in a workplace or even if bedrooms, is usually higher than their male counterpart. So when you use the methods to create a Yin Yang balance in your home, remember who you’re doing it for. Is it for you? For your partner? Your children? If it’s for two or more individuals sharing a space, find the mid-point of their Yin-Yang requirements. That way, everyone can reap the benefits from the new adjustments that you’ve just put in place. The above guide only gave you a general idea of how Feng Shui’s Yin Yang theory is applied, which is a great way to start when you begin to Feng Shui your home. Although there are many ways where Yin Yang can be further applied, such as the number of fishes in your aquarium, do NOT overdo it. There’s no need to overly Feng Shui your home and apply Feng Shui to everything you see. That way, you’ll enjoy your space a lot more! Do you have an overly Yin or Yang space? If so, what was your experience? Share your stories with us by commenting below! Thank you Victor. This was a very good article which explained to me thoroughly the balancing of the energies in a home. Your articles always make perfect sense and are so easy to understand. This article is especially valuable as I am moving in October and will definitely take your ideas into consideration. Thanks for the compliment, Valerie!